I warmly welcome and support the proposals to rebuild a section of Hills Road with segregated cycle tracks. I urge you to see the Big Picture and ambition of this scheme and unequivocally support the proposals. Please also get involved in the discussion on the details but don’t let that overshadow the overwhelming benefits that the scheme will bring. About 1km (0.7 miles) of Hills Road will be rebuilt on both sides to provide three networks that are segregated from one another. People walking will have a pavement to themselves, people cycling will have an uninterrupted track segregated from motor vehicles, and those in motor vehicles will have fewer worries about cycles. The three network approach is part of how the Dutch have succeeded in transforming their towns and streets in to liveable places. Although a huge number of people in Cambridge cycle at the moment this is despite the infrastructure and not because of it. 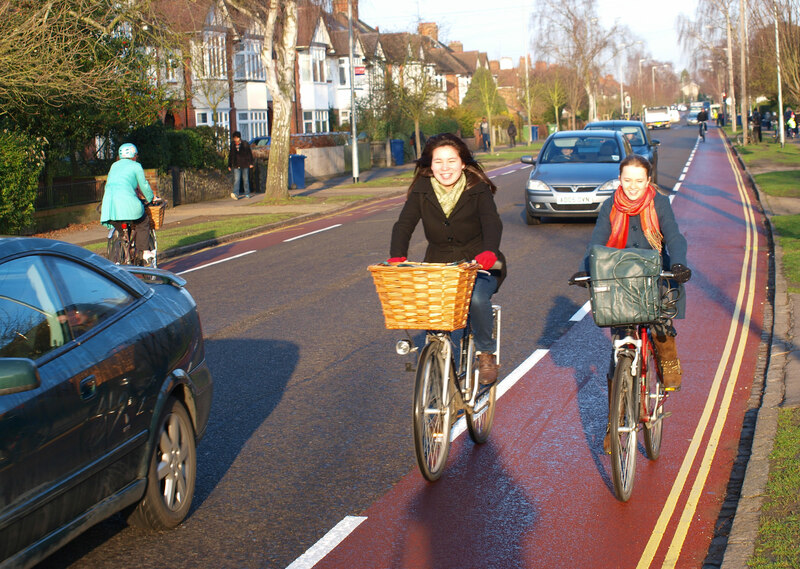 Many people don’t want to cycle on the road and mix with cars and buses – they perceive it as dangerous. 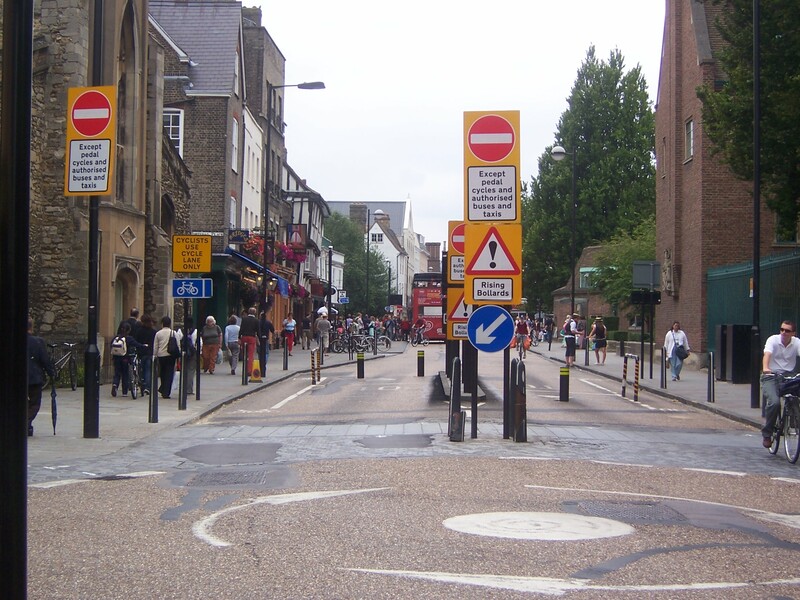 Some of them cycle on the pavement, where they are separated from cars by a barrier – a kerb – and not just a white line. If we are to encourage these people to cycle there has to be a network designed for cyclists, and that means one not shared with people walking and driving. By getting more people cycling their health will improve, congestion will be reduced and air quality will improve. It means we won’t need to build expensive and ugly new roads as Cambridge grows. Yes, this part of Hills Road is just a small part of the transport network, however these changes are hugely important. 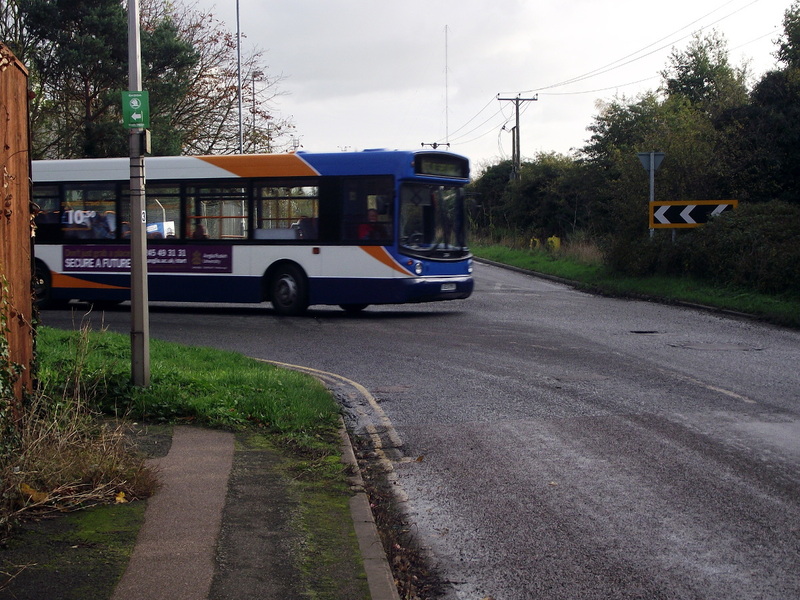 They will become a model for future improvements in Cambridge (and elsewhere) and once built and successful there will be added pressure to continue the rebuilding south to Addenbrooke’s and north to the city centre (as well as other routes). The ‘fully segregated’ option should be built where the cycle track is separated from the road by a standard height kerb, about 100mm. When people cycle on the pavement it’s quite clear that they feel safe with a kerb between them and motor vehicles. The ‘raised’ option with a kerb of only 25mm isn’t going to give that perception of safety. 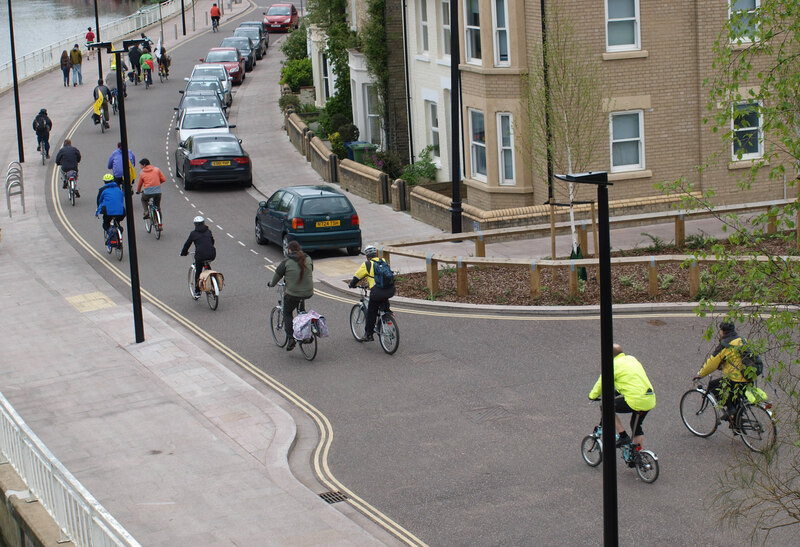 The cycle track should be dropped slightly, 25–40mm, from pavement level using sloped kerbs. A small difference in height provides very effective segregation between people walking and cycling, we see this on Carter Bridge where people mostly keep to ‘their’ side. However a sloped kerb with a small drop does not present a major barrier to anyone trying to cross, including those with limited mobility or with a pushchair or luggage. 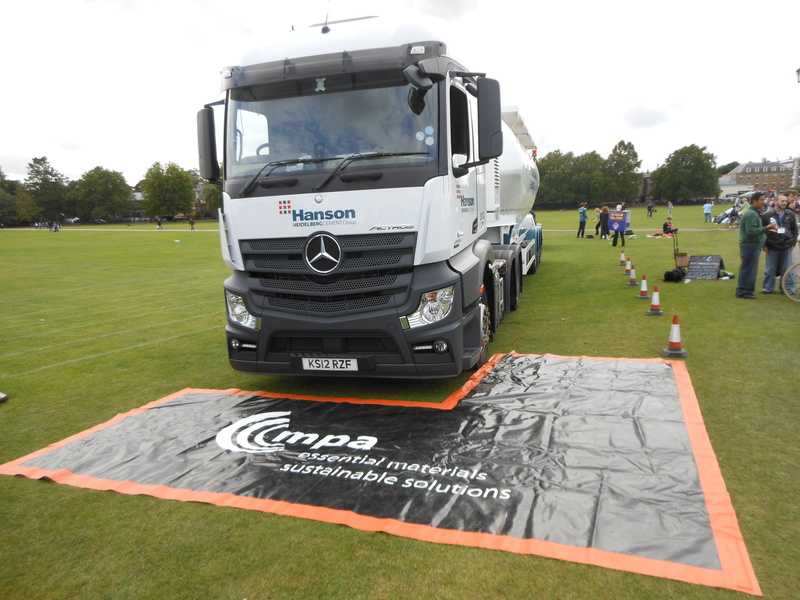 A small drop will limit the amount of leaves and debris that could build up in a deep cycle track. It also makes the cycle track feel wider. There is some concern that a width of 2.1m may not be enough, however if the kerbs are low you can cycle right up to the edge of the track, something you can’t do with high kerbs. 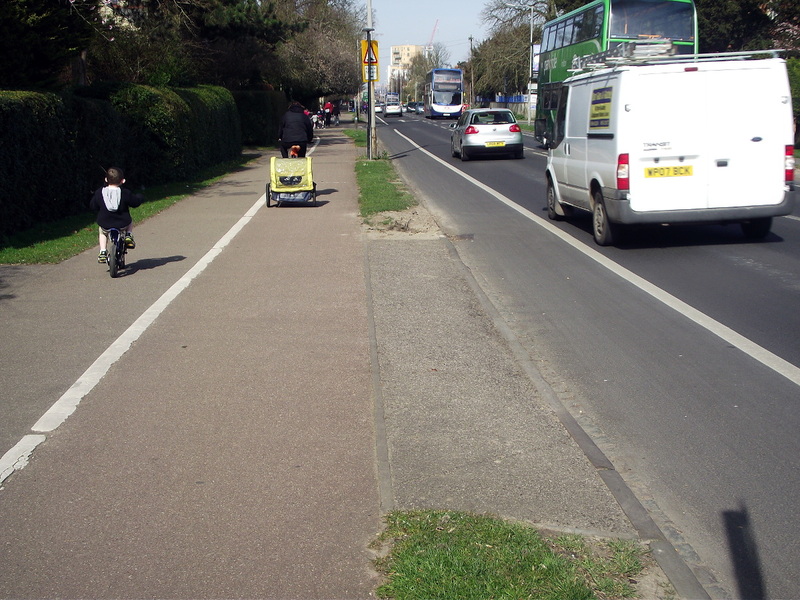 Low kerbs mean cycles can make use of the entire width whereas high kerbs reduce the usable width. The proposal describes the cycle track as having priority over side roads, though it only has priority in the same way as on-road cycle lanes have. This should be improved in two ways. 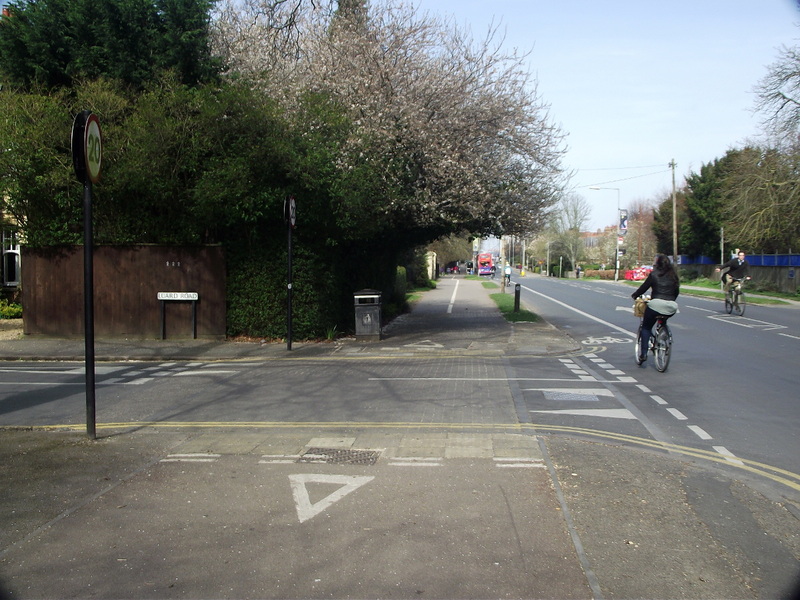 Firstly the cycle track and pavement should continue at the same height across side junctions, and not drop down to road height. This is similar to what exists at the junction of Luard Road and Hills Road. 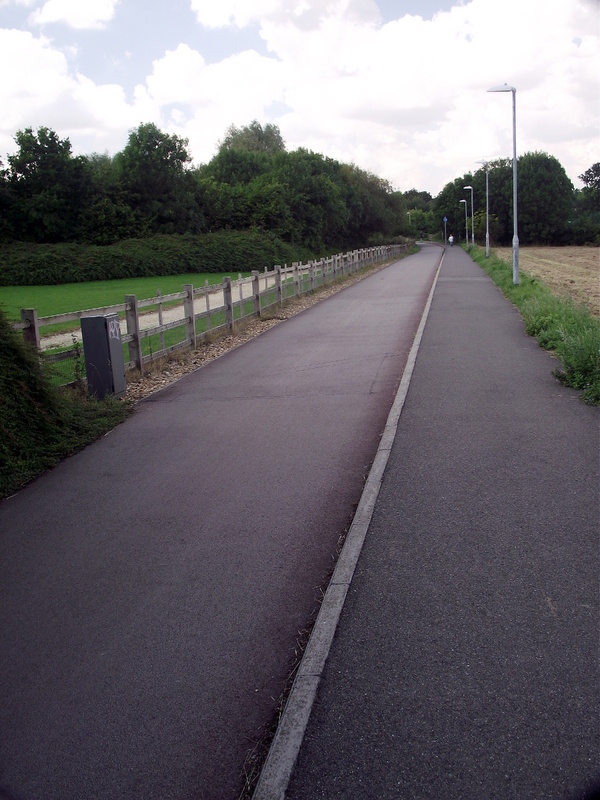 The shared use pavement continues at the same height across Luard Road. The view from Luard Road of the junction with Hills Road. In the new scheme the cycle track would be closer to the main road, set back by only the 600mm kerb width, and there would not be give way markings on the cycle track. The change in height means motor traffic has to slow. The ramps would be sharper in the new scheme as the width of the ramp would be only 600mm. Most of the side roads on this section of Hills Road are minor and do not have much traffic, the exception perhaps being Luard Road that has rat-running traffic. If you think that motor vehicles won’t give way to the cycle track, have a look at this video from Luard Road, though I’m not claiming that all vehicles slow. A ramp to provide access over the shared use path to a private driveway. The ramps across side roads would be similar to the existing ramps to driveways, though not quite as wide. A problem where on-road cycle lanes cross side roads is that I have to look over my shoulder to check that a car isn’t about to overtake me and cut across – a ‘left hook’. Having the cycle track raised across the junction will help to slow turning traffic however a second improvement would be to end the kerb should as close as possible to the junction. In the proposals the end point seems set back from the junction, which will encourage faster turns. 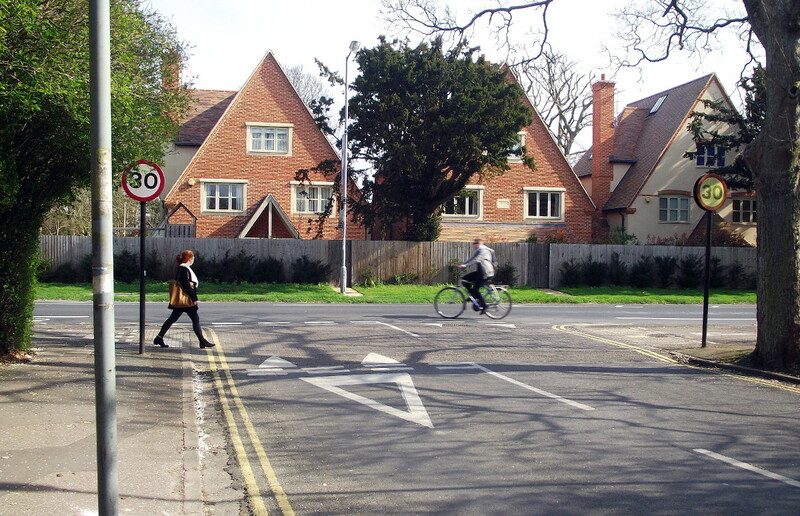 Hills Road is a relatively attractive approach route to the city due to the verges, the trees lining it and the relative sparsity of street furniture such as signs and railings. The cycle tracks should attempt to improve the streetscape or at least not degrade it. Adding cycle tracks must not mean a forest of bollards and signs and paint everywhere on the road, if the road looks ugly there will be understandably opposition to building cycle tracks elsewhere. With some changes to the proposals I can see this being a very popular cycle route. Please look at the proposals and comment via the County’s consultation page. Richard Johnson, City Councillor for Abbey (that covers Riverside), is going to pass on the ideas to councillor colleagues and officers and report back on the feasibility. Ian Manning, County Councillor for East Chesterton, has added this to the list of schemes for the North Area Committee to consider. Ian Manning will put a motion in front of Cambridgeshire County Council in February to get street schemes tried in a quick and cheap manner. Sometimes, despite lengthy consultation over paper plans, we spend a great deal of money on something that has an obvious fault once it hits the ground; then we have to wait years to spend money to rectify it. Cllr Manning thinks cheap trials could save money. He has been in contact with the New York Mayor’s office! Peter Roberts, City Councillor for Abbey, expected to talk to a representative from Riverside residents today. When I created the original post I had no real idea what to do next or what interest there would be; I created the sketches as a talking point. So far the post has been seen by about a hundred people. I’m really pleased that the concept of trying things out quickly and cheaply – paint and planters – has been picked up. What can you do? Please contact your County or City councillor and let them know your views. Don’t assume that they already know about these ideas as they are busy people and many don’t use social media. NYC Streets Metamorphosis from Streetfilms, click to go to Vimeo to watch. 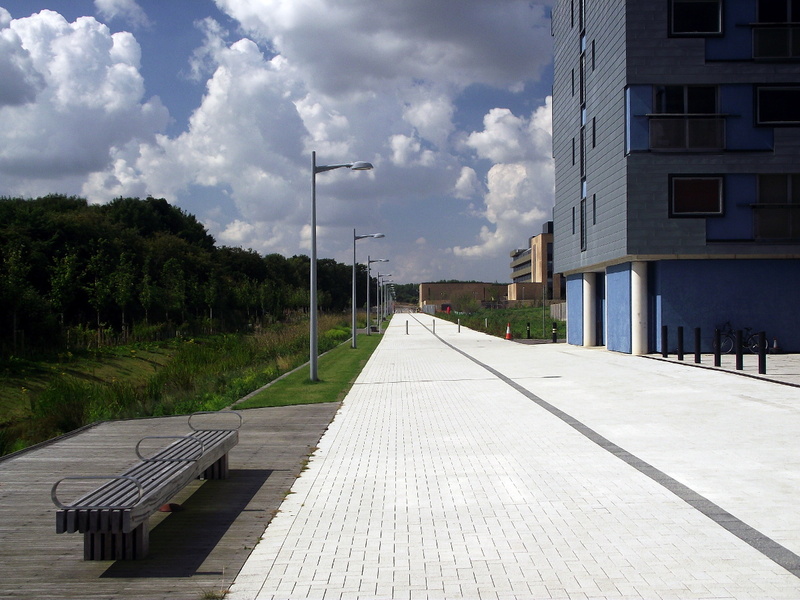 Riverside in Cambridge is a very busy walking and cycling route, an important commuting route to and from the city centre, and it could also be a fantastic leisure walkway connecting the city to Stourbridge Common and further afield. It used to be an industrial area with the town gas works situated there amongst other uses, now it’s bordered by homes but the highway remains in a poor state with narrow pavements, poor drainage and a lumpy road surface. Prompted by a ‘2014 wish for Riverside’ on Shape Your Place I investigated how we can improve things quickly. As local councillor Richard Johnson points out, rebuilding this stretch with a boulevard is a long-term project, not least because of the cost. 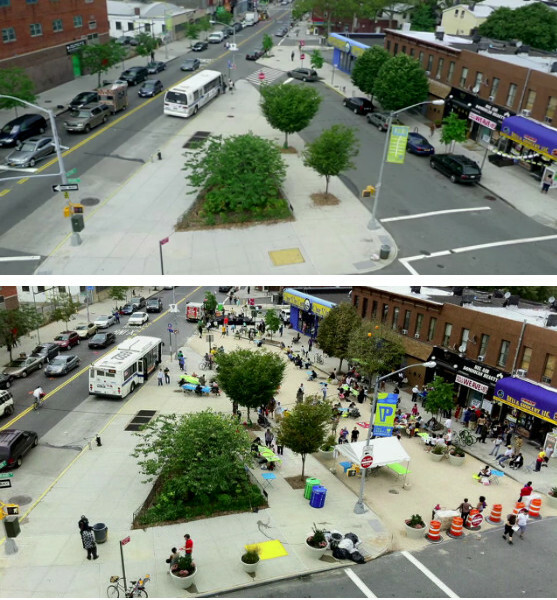 However the city of New York is transforming its streets into places for people using the mantra ‘do bold experiments that are cheap to try out‘. Let’s do that on Riverside by summer 2014. Diagram of some quick changes to Riverside between Priory Road and Riverside bridge. Let’s improve the next 300m from Priory Road (the end of the existing scheme) to Riverside bridge. 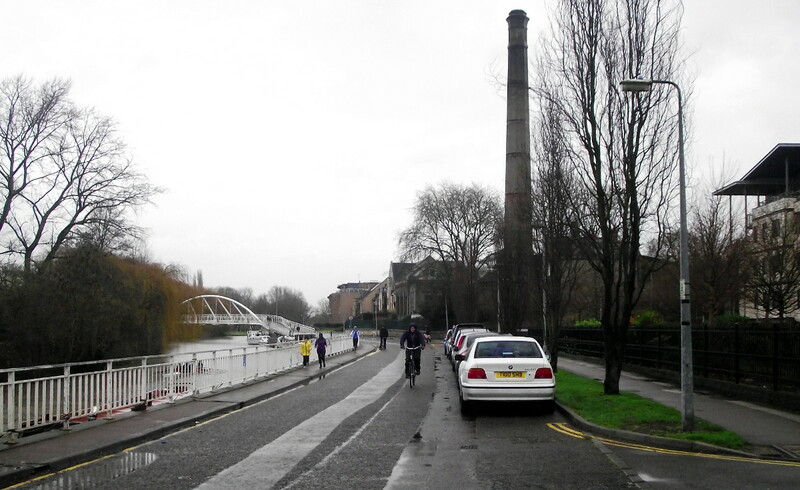 We can quickly create a continuous walkway to make Riverside better for people walking and cycling. The layouts below are just an example, go to Streetmix and try out some alternate layouts for yourself! For comparison this is what has already been built: the walkway has a clear area 3m wide and the driving lane is 3.6m wide. Proposal for section B, Priory Road to Saxon Road. Riverside is wide here so more parking could be created on the right. The temporary walkway would extend from the left out to the dotted white line. In this section a portion of the parking is changed from parallel to the kerb to perpendicular to provide more spaces. 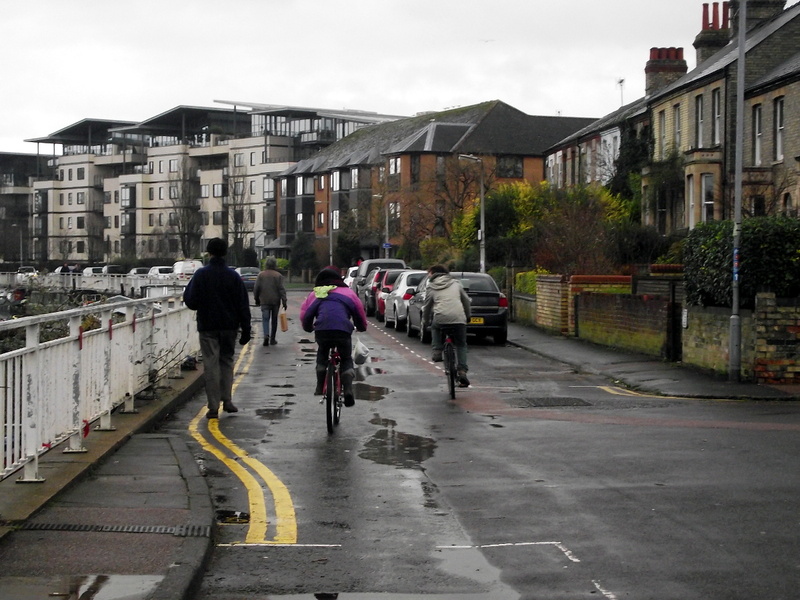 The existing narrow pavement is widened by 2m and there is still space for a wide lane for cars and cycling. 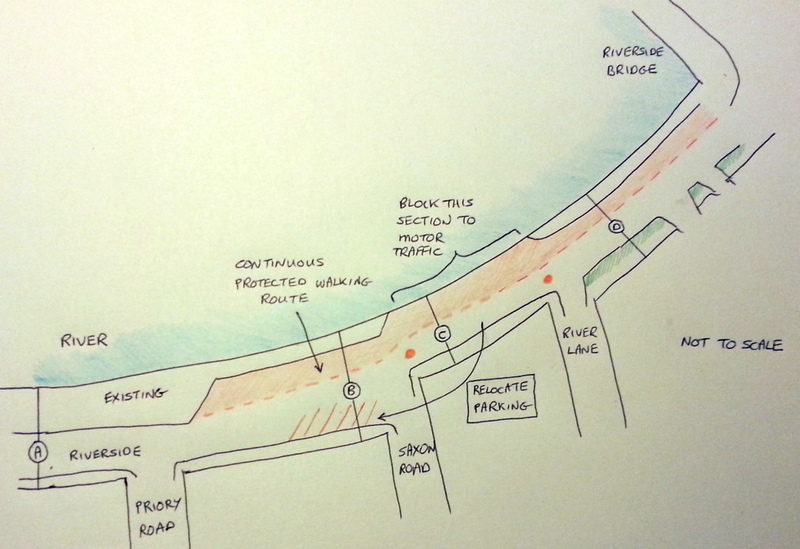 Proposal for section C, Saxon Road to River Lane. With no pavement on the left people walking mix with cycles and cars in the road. 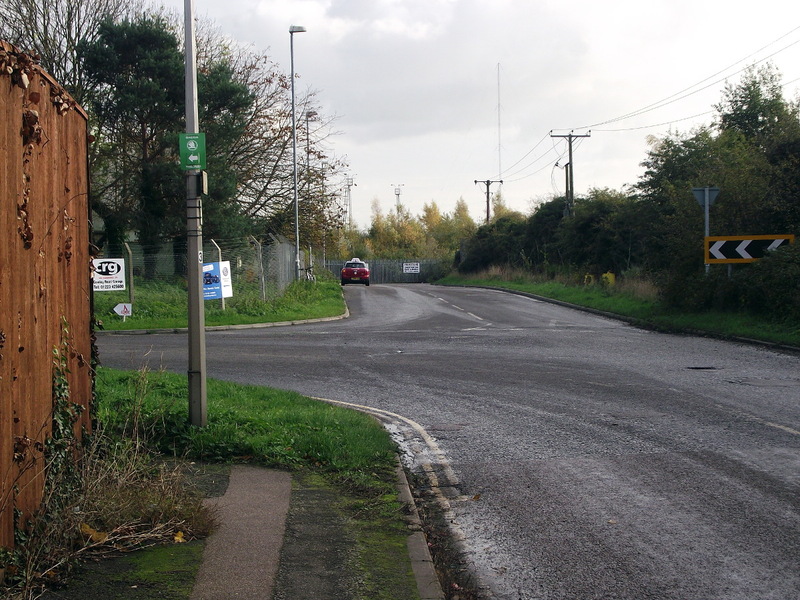 By relocating car parking, the temporary walkway would use half the entire width here, roughly continuing the dotted line in the right foreground of the picture. The space is very limited here and there is no pavement on the river side. By relocating the parking to the other side of Saxon Road this section of the Riverside can be closed to motor traffic and the walkway can continue uninterrupted. Proposal for section D, River Lane to Riverside bridge. Riverside widens out again and by removing parking the walkway can be widened. The existing parking on this section is removed so the walkway can be widened by 2m while keeping a wide driving and cycling lane. 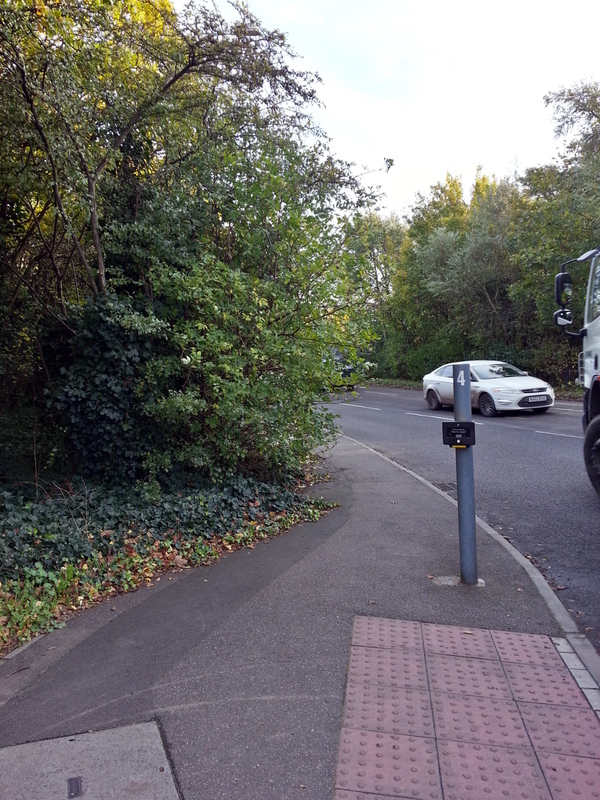 The bollards could be moved forward from the bridge to the bottom of the path up to Newmarket Road/Tesco. 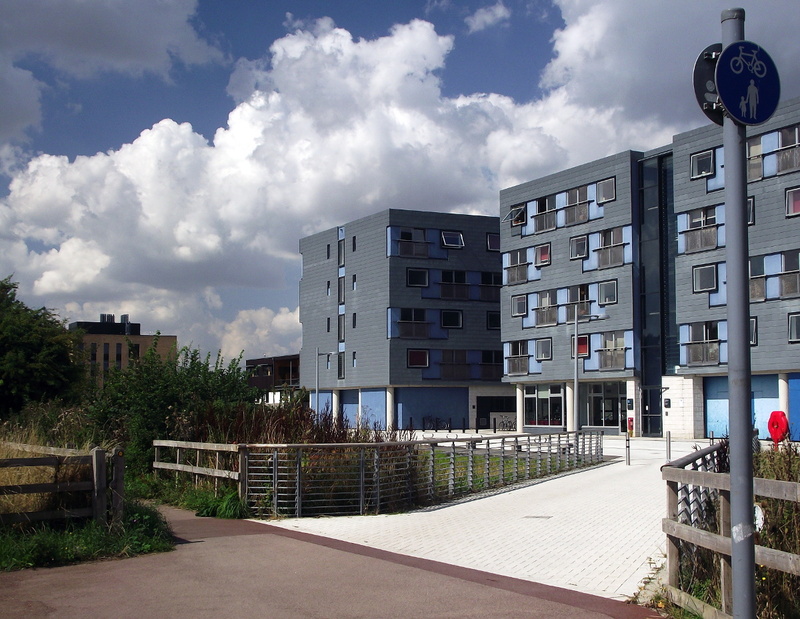 The as-built scheme cost in excess of £300,000 for about 200m and took about nine months to build. I want the next 300m to be tried out quickly and cheaply. We can do this using only paint and planters or bollards both of which are inexpensive and easy to remove. 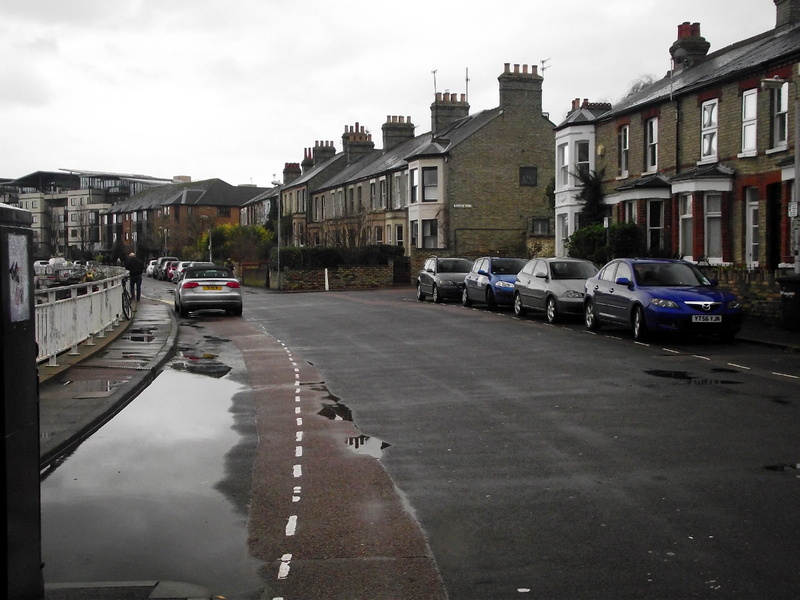 The street on the right of the triangular junction was improved (below) as a trial using paint and planters. New York City is testing out new schemes quickly and cheaply as this 15 minute TED Talk by Janette Sadik-Khan, transportation commissioner of New York City, explains. So let’s use paint and planters to try a continuous walkway on Riverside. I don’t know what this would cost; suppose it was £10,000? The County Council and the City Council’s Area Committees all have money they can allocate to small schemes like this, so how about a split between the County and the North and East Area Committees? I think they could each find £3–£5k for this trial. The changes could be made within a few weeks, so let’s have them in place by summer 2014. Some people will say this scheme isn’t possible because of the removal of parking or because closing a portion of Riverside would cause problems, and that’s exactly why we need a trial: to see how it will work and what problems there might be. And remember that the paint and planters can be easily removed. The trial won’t fix the dodgy paving, the poor road surface or the bad drainage but it will improve Riverside for people walking by giving them more space and it could largely eliminate the contention between people walking, those on bicycles and in cars. It will mean we have a rough design so when money becomes available we can start building it. So how about it councillors? Can you find the will and a small amount of money to start the transformation of Riverside? Can you ‘do bold experiments that are cheap to try out’? Update: One week on we have some commitments! Update 2: On 25 March 2014 a motion from Ian Manning was passed by Cambridgeshire County Council with all but one councillor in favour. It calls on the County to deliver projects using this fast trial approach. The motion gives some very good reasons for doing this. I congratulate Ian Manning on getting the motion passed and thank councillors for their support but most of all I look forward to faster, cheaper, better changes to our streets. A sketch of the proposed development from A Guide to the Cambridge Plan. East Road is in the foreground. Note the similarity to the as-built development. In a previous post I looked at some recent developments in Cambridge, now let’s skip back 50 years and compare these to a new development from the 1960s: Ashley Court between Norfolk Street and East Road in the city centre. …demolishing all the buildings (except those of outstanding architectural or historic value) in a sizable area and laying out a fresh pattern of streets and open spaces, so as to form sites convenient in size, shape and situation for new buildings of th kinds that are most needed in that area. The Guide also includes a sketch (above) entitled ‘redevelopment scheme, East Road’ with no further explanation but it suggests that plans were advanced at the time. 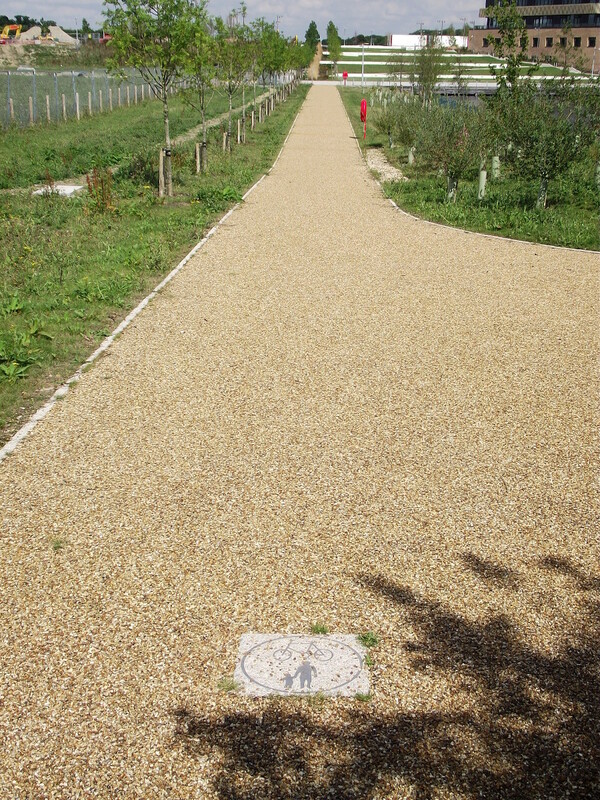 One of the paths through the development. A comparison with a modern-day aerial photograph shows that the built development is very similar to the sketch. The developed area appears to have been bounded by Norfolk Street and St Matthews Street, an area of about 7 acres/3 hectares. 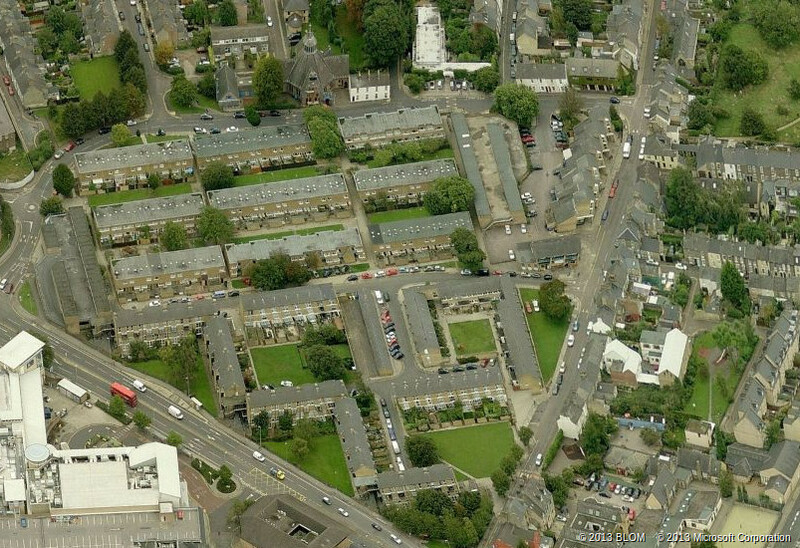 The general layout of the area follows the pattern of New Town and Expanded Town planning in the UK after the Second World War: the front of houses face on to green open spaces that provide convenient, direct and safe walking routes through the development and connection to the surrounding area. 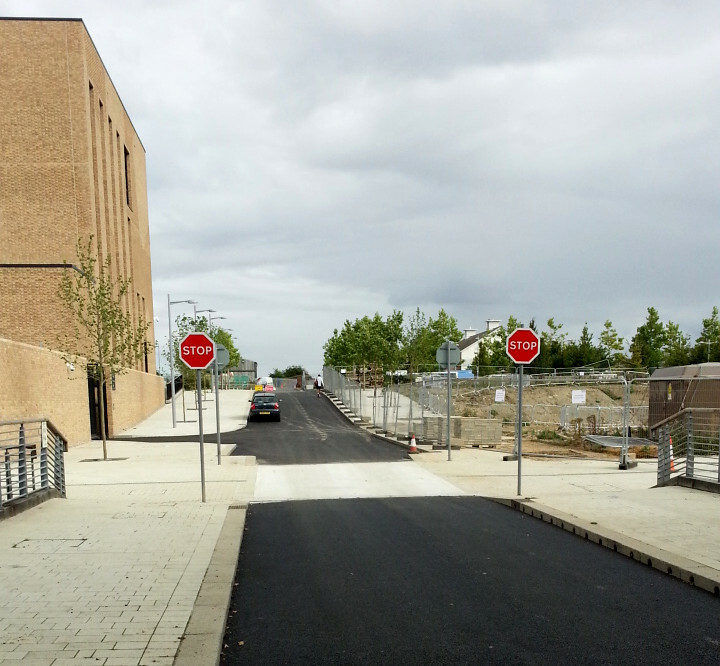 We now call this filtered permeability and a look at OpenStreetMap shows the numerous path across the development. There are no through roads, instead dead-end feeder roads link to garage areas. 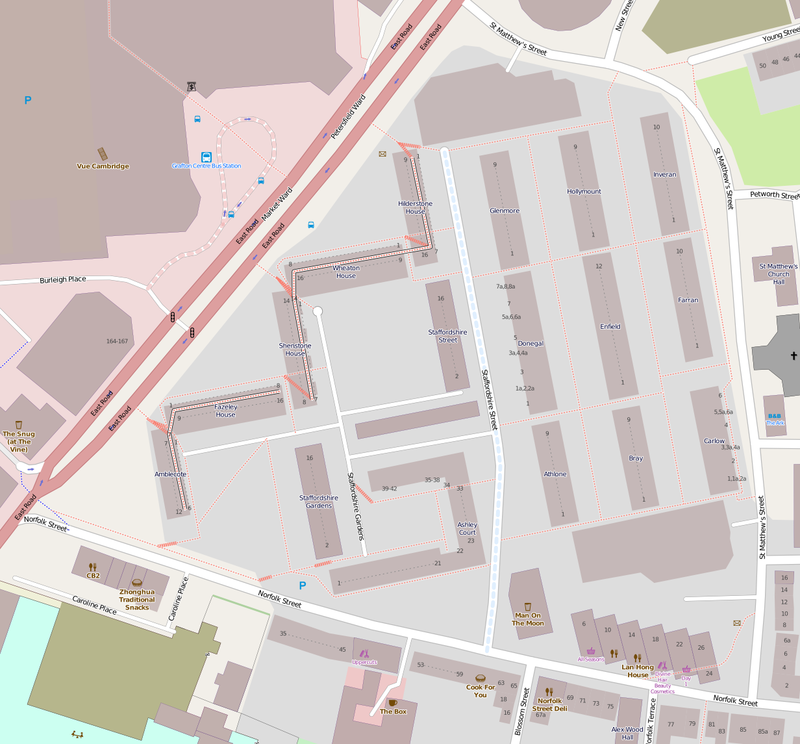 Two large two storey car parks were built (the unnamed blocks at the north end and south east corner on the map to the right). In addition a pub and six shops were included in the development. There is a variety of layouts and styles of building and a large amount of open space divided in to smaller areas with a human scale. No doubt land in the centre of the city was cheaper when this area was rebuilt, nonetheless more houses could have been squeezed in. Overall this is a high quality development that was carefully planned with consideration for the people who would live here. It’s not perfect of course. Despite the good permeability of the site I have not walked through it on the way to somewhere, perhaps this is no bad thing as it provides some privacy for the residents. The garages have proved too small for modern cars leading to the two garage areas being underused and they could be demolished. 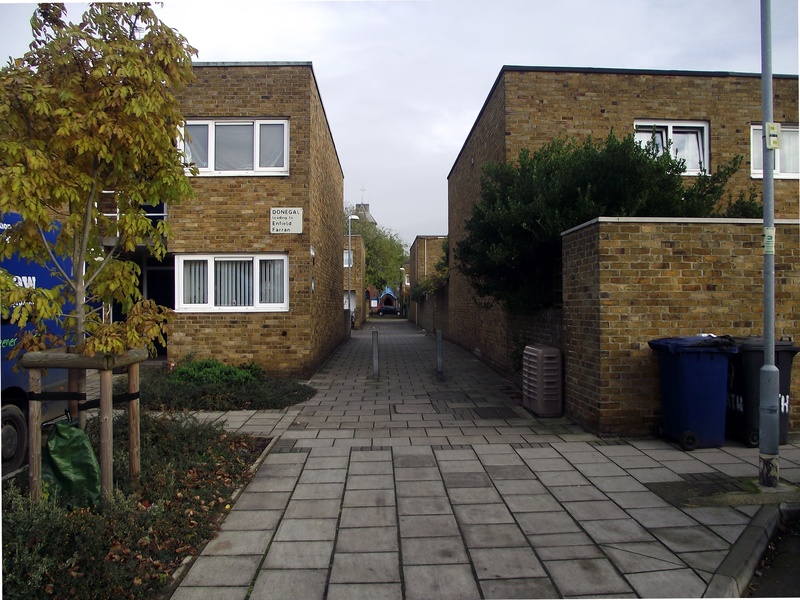 These remote garages became unpopular in numerous developments due to the risk of crime and these days people seem to expect their car to be right outside their front door. Some of streets in the area are therefore packed with cars (mostly off-road) and aren’t particularly pretty. Despite being some 50 years old the development remains in good condition and appears popular: clearly high quality planning that is designed for living lasts. Green space and private gardens at Glenmore. Shenstone House with private gardens in front of green space. Back in August Cambridgeshire County Council promised us a “high quality, safe and accessible cycle infrastructure along Cowley Road” as part of its Transport Assessment for the proposed Science Park station and I expressed my skepticism about what “high quality” would mean on the ground. 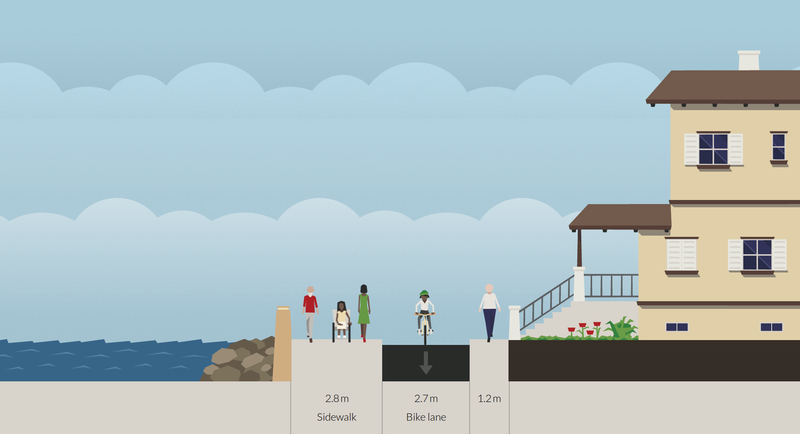 Now an illustrative proposal shows a shared-use with five give ways in ¼ mile. So high quality = shared-use to the County despite people on foot and on cycles hating it and cyclists being fined or getting a criminal record for being confused about where they can and can’t cycle on pavements. I’m not going to dwell on how rubbish this is, it’s a design from the last century. Instead I will highlight the high risk of death and serious injury that people on cycles will face at the junction where Cowley Road turns north while the station access road continues east. Cowley Road/Cowley Road junction with proposed shared-use path in mid gray. The priority is changing so the north arm of the junction will have to give way, as will people on cycles traveling to the station, which is east of this junction. Here’s the proposal with the lorry and bus movements superimposed. Note that the Stagecoach bus depot is to the north while the Hanson aggregates terminal is on the north east corner so there are a lot of large and heavy vehicles at this junction. Most of this traffic turns the corner. 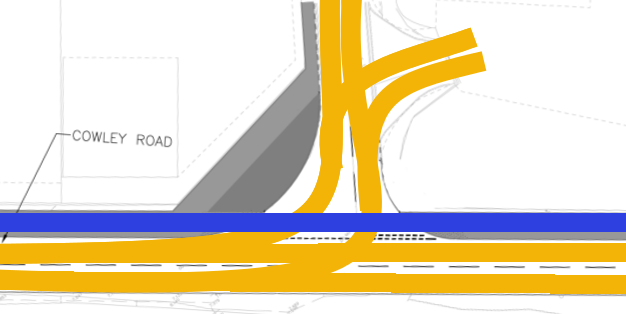 Proposed junction layout with lorry and bus flows in orange and cycle and pedestrian flow in blue. There is a fence adjacent to the north west corner so visibility is poor. Maybe you thought the road was clear? Suddenly a bus appears from around the corner. 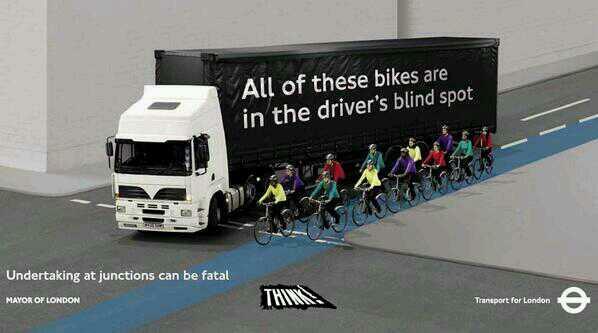 Poster on lorry blind spots. A lorry turning left on Cowley Road with cyclist on proposed cycle route. 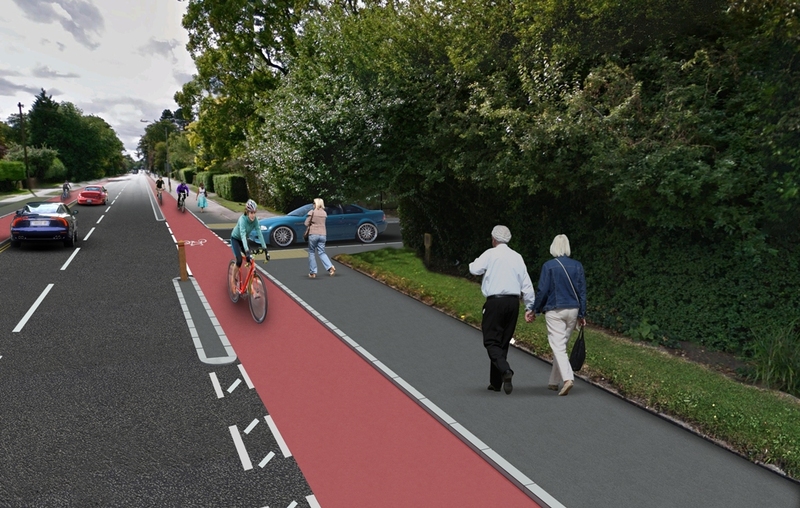 The junction on Cowley Road will have a similar layout with people on cycles using the shared-use path likely to be in the blind spot of turning lorries. 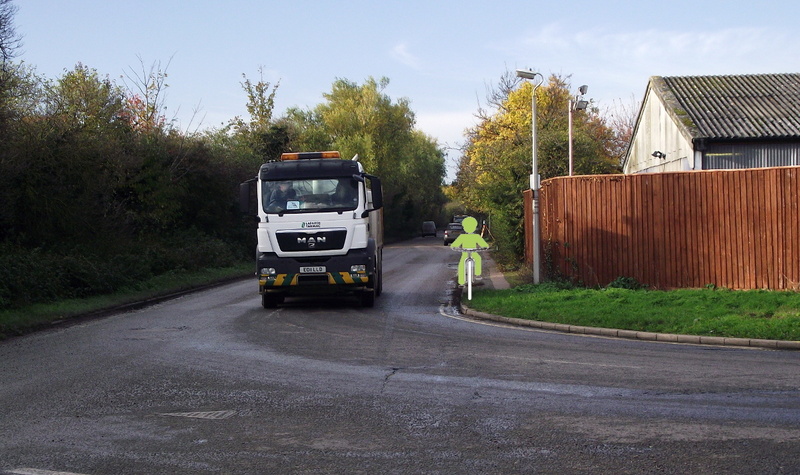 As the lorry slows to turn the corner a cyclist could move alongside it and become invisible. The illustrative proposal is neither safe nor high quality, I look forward to the next iteration. Bushes overgrowing the current shared-use path push people very close to traffic, such as the lorry visible on the edge of the picture. The development shall not be occupied until details of the footways/cycle ways have been submitted to and approved in writing by the Local Planning Authority and have been implemented including a route to a minimum width of 2.5 metres along Cowley Road. Although this does mean the County has to agreed details with itself it is very disappointing that the minimum width specified is less than Department for Transport guidance.